What Does Code P0615 Mean? OBD II fault code P0615 is a generic code that is defined as “Starter motor relay -circuit malfunction”, and is set when the PCM (Powertrain Control Module) detects an abnormal voltage in any of the circuits that pertain to the starter motor relay. In terms of operation, the starter relay is a switch that closes a high-amperage circuit to supply battery voltage to the starter motor when it is activated with a low-amperage circuit. The advantage of this approach is that the ignition switch does not have to cope with the extremely high amperages that some components, such as the starter motor, require to work efficiently. For a relay to work, it requires an input voltage, and in this case, the input voltage is supplied when the ignition key is turned to the “Start” position. 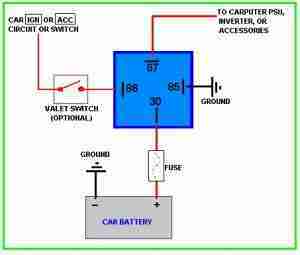 When the input circuit is completed, an electromagnet is activated, and battery voltage is passed through the contacts (which are kept closed by the magnet) directly to the starter motor solenoid, which in turn, activates the motor itself to crank the engine. When the ignition key is released, the input voltage is interrupted which de-energizes the electromagnet, thereby causing the spring-loaded contacts to return to the open position. Depending on the application, the starter relay may have more than the usual four pins. On four-pin designs, one pin is for the input voltage, and one is to lead the input voltage back to battery negative, or ground. Of the two remaining pins, one is connected to the battery (usually through a fuse), while the other is connected to the component, in this case, the starter motor solenoid. On a five-pin design, one pin is usually used for a feedback signal to the PCM. 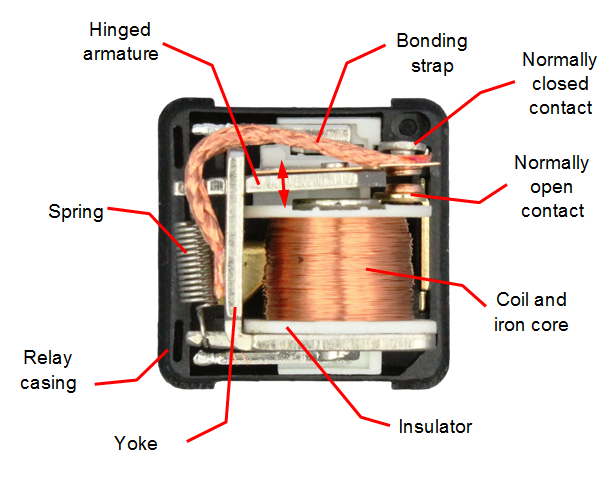 The image below shows a typical four-pin 12V relay, such as might be found in the starter circuit of many applications. Note however that on many modern applications, the relays are not electromechanical. Instead, relays are of the solid-state type in which electronic switches are used, thus eliminating all moving parts from the relay. What are the common causes of code P0615 ? What are the symptoms of code P0615 ? How do you troubleshoot code P0615 ? NOTE: Non-professional mechanics should take note that a failure of either the starter relay or the ignition switch can mimic the symptoms of a defective starter motor. Therefore, do NOT condemn the starter motor and/or the ignition switch out of hand until all other possibilities have been investigated. Refer to the simple wiring diagram below for details on how almost all relays are wired, and follow/test each circuit in turn to either eliminate or confirm wiring issues as the cause of the problem, before any major component is replaced. Note that on applications that use a feedback circuit, the pin for this circuit will almost always be marked as “87a”, and be located between the other four pins. Note that the circuit leading to “Accessories” in this diagram will be the circuit leading to the starter motor solenoid. If a no-crank condition is present, refer to the manual to locate the starter motor relay fuse. If the fuse is blown, replace it with the correctly rated fuse, and attempt to activate the starter motor via the ignition switch. If the vehicle starts and the fuse does not blow again, the problem is almost certainly solved. Bear in mind that fuses very often do not need a reason to blow; almost any fuse can blow after long use, simply because the filament weakens over time. However, if the fuse shows signs of overheating or arcing, do NOT simply replace the fuse before investigating the reason for the overheating and/or arcing. However, if the fuse is NOT blown, remove it from its holder, and use a dedicated fused-circuit tester to test for voltage and resistance in the circuit. 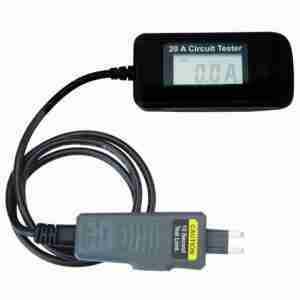 The image below shows a typical circuit tester that can be had from almost any auto parts store for a few dollars. NOTE: The object of this test is to verify that battery power is available to the relay via the ignition switch. Note that while this and other circuits in the starter circuit can also be tested with a digital multimeter, using fused-circuit tester is easier, since both continuity and resistance can be checked without running the risk of inadvertently causing short circuits in the confines of a fuse box. If this circuit checks out, locate the starter relay, and follow the directions in the manual to test the operation of the relay. This test would typically involve testing the resistance of the coil across the contact points when the points are closed, or are supposed to be closed. Note that you may have to make up jumper wires to energize the coil, so follow the directions carefully to avoid testing the relays across the wrong pins. Typically though, the relay must pass battery voltage across the contact points when they are closed. If it does not, check that the battery is fully charged before condemning the relay. If the battery is fully charged, replace the relay if it passes less than battery voltage, or if it passes no voltage at all. If the fault persists but the relay checks out, refer to the manual to locate and identify the wire that runs from the relay to the starter solenoid. The termination of this wire often fails due to the high heat it endures, so remove this wire from the solenoid, and check the termination for signs of damage, corrosion, or overheating. Repair, or replace this wire as required. Check this wire for continuity, and that its resistance falls within the specified range. 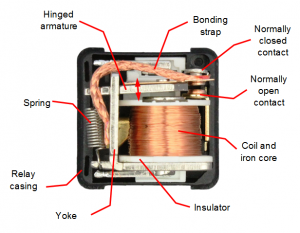 Bear in mind that this wire must deliver full battery voltage to the starter solenoid, so make sure that its resistance falls within the manufacturer’s specifications. At this point it is always a good idea to test the operation of the starter solenoid. To do this, attach a jumper wire (of the same gauge as the existing wire) to the battery positive terminal, and touch the other end to the point on the solenoid where the existing wire attaches. If the starter solenoid works, the starter motor will engage immediately the wire touches the terminal. NOTE: If performing this test does not activate the starter motor, the starter motor solenoid is defective, which can in some cases mimic the symptoms of a failed relay. Repair or replace the starter motor as required. WARNING: Make sure the ignition is in the “OFF” position during this test to prevent the engine from starting. Also make absolutely sure the exposed end of the jumper wire does NOT touch ANY part of the engine or body work other than the terminal of the starter solenoid, since this wire now carries full battery voltage and amperage; if it touches anything it could set off a catastrophic short circuit, so use extreme care. If the starter motor engages with a jumper wire, and the relay checks out, it is likely that the electrical part of the ignition switch is defective in that it does not pass a current to the (low current) input side of the starter relay. However, if the application is fitted with an aftermarket immobilizing device, it is equally likely that this device is defective, since immobilizers of this class are not exactly known for their reliability. While it is possible to remove such a device on a DIY basis, it is nonetheless recommended to have it removed by a competent auto electrician to minimise the risk of causing short circuits. If the application is fitted with a factory-fitted immobilizer, there will almost certainly be other codes present if the immobilizer or other feature of the security system is malfunctioning. If no such codes are present, and no security system related warning lights are illuminated, it is almost certain that the ignition switch is defective. If it is certain that an immobilizing device is not the cause of the problem, consult the manual to locate and identify all wiring that is associated with the starter circuit. Also determine the exact routing, color-coding, and function of each wire in the circuit. Perform resistance, continuity, and ground integrity checks on all associated wiring as per the instructions in the manual, but pay particular attention to the condition/integrity of the feedback circuit if the application has such a circuit. Compare all obtained readings with the values stated in the manual, and repair or replace all wiring as required to ensure that all electrical values fall within the ranges specified by the manufacturer. NOTE: Pay particular attention to system grounds during this step. Disconnect all ground connections, and clean of all rust and/or corrosion to ensure that proper contact is made when the connections are retightened. Clear all codes after repairs are complete, and attempt to start the engine using the ignition key. 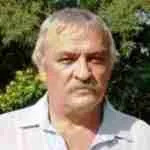 If the engine does start, the problem is likely resolved. However, if the engine does not crank, and all wiring, fuses, and relays check out, the ignition switch is defective, and must be replaced. Be aware however that replacing an ignition switch sometimes requires the partial disassembly of the dashboard, and/or the steering column. In some cases, it is necessary to remove the steering wheel, which has to be done in strict accordance with the instructions provided in the manual to prevent the accidental deployment of some airbags. While it is possible to replace the electrical part of the ignition switch on some applications on a DIY basis, it should be noted that this procedure often requires the use of special tools and equipment, which equipment may include memory saving devices to keep critical systems powered up when battery power is removed to deactivate some airbags. For these and other reasons, the wisest course of action is to refer the vehicle to the dealer, or other competent repair facility when an ignition switch has to be replaced. Bear in mind though that intermittent faults in the starter relay circuit are common on the one hand, and that finding and repairing intermittent faults can be extremely challenging and time consuming, on the other. In some cases, it may be necessary to allow the fault to worsen considerably before an accurate diagnosis and definitive repair can be made, especially if the intermittent fault is located in the ignition switch. None found. Ask a question about P0615.